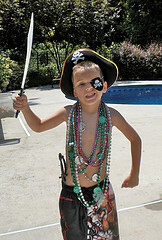 Pirate party games will make your pool party one to remember. 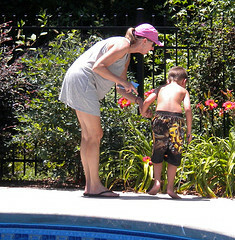 Find games for all ages - using the pool or your backyard. Start by giving the teams names like the Pirate Petes and the Jack Sparrows. To act like a pirate you need to look like one. When the guests first arrive hand out felt eye patches to each of them. They are very inexpensive and the kids love them (and so do adults). Be sure to get the soft fabric kind and not the hard plastic ones. There are also pirate eye patches with a peep hole that are the best. 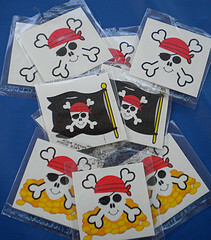 While waiting for all the guests to arrive have the children and adults pick out their favorite Pirate Temporary Tattoos . Play some pirate music on your portable iPod speakers. I downloaded the song, Captain Drew, The Pirate, from iTunes. Have a bowl of water and a washcloth ready. Take off the protective plastic shield. Put the tattoo on the arm and then hold the wet washcloth on the tattoo until the design "takes." These Pirate Tattoos stayed on great and the pool water didn't affect them at all. Don't just hand out the pirate hat and sword. 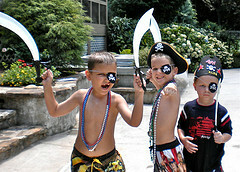 Turn this into pirate party games by sending the kids on a little treasure hunt to find them. Give each guest a clue that also tells them their pirate name. Use their pirate names through out the party. We used foam pirate hat craft kits and decorated them before the party. The craft included foam letters, so we put their pirate name on the hat. 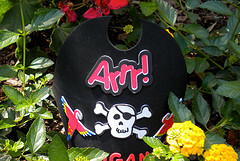 For around the pool and water, the foam pirate party hats are better than cloth or cardboard. 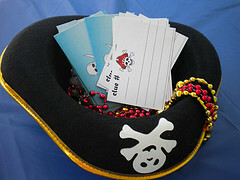 Here is an example of the clue we used for this pirate birthday party. 1. For younger kids purchase gold coins or gold coin candy and hide them in different places in the yard. Give them a simple treasure map just for the sake of the theme. Hang the plastic pirate swords from low tree branches or bushes. Give each pirate this clue to find their sword. Black Beard is a bucco, Aye? Find your sword hanging high. These plastic pirate swords were a big hit! Who knew that little boys would love these plastic necklaces?! Place several necklaces on the pool bottom near the Swim Thru Rings . Let each pirate take a turn swimming through them while gathering their "treasures" along the way. I'd suggest you get enough necklaces so that each player can keep the treasures that they "found". The boys would have liked it if there had been enough necklaces for each of them to take home several. The weighted coins and gems sink to the bottom of the pool and the treasure chest floats. Buy a set of two and let each team member take turns to see who can gather their treasures and get them into their treasure chest first. Kids love to play this game over and over. Add some pennies, nickles or quarters for some added treasure. OK, this cool pool toy may be over the top, but if you get it at the beginning of the summer and use it all season and not just for a pirate pool party, it may be worth it. It goes for about $28. The pirate ship has a squirt gun with a tube that goes down into the pool - so it has limitless water suppy. These are the greatest pirate rings, made of soft rubber. We used these dive eggs and placed a ring in each egg. Throw the eggs at a depth that matches the kids swimming abilities and one at a time have them dive in to get their "prize." One at a time have the kids swim through the three hoops and try to gather as many eggs as they can. Each player get's to keep the money that was in the eggs they gathered. Using your own pennies, nickles or quarters, toss the coins in the pool at a depth appropriate for your guests. Or use these colorful gems for sunken treasure. Divide the kids into two teams. One child goes at a time and is to get as many coins as possible in one breath. With a treasure chest for each team, have each swimmer put his coins or gems into their teams treasure chest. The team with the most money wins. Hand out pirate ship flags to each of the winning team members. If you don't have a pool, hide the coins or gems in your yard. Give each participant a set amount of time to find as many coins as possible. Get two swim tubes - one for each team. One at a time the participant races across the pool and back. He hands the tube to the next team mate. Whichever team finishes first wins. Add some variations such as the team member has to put on 5 necklaces, race across the pool and back, transfer the necklaces to the next team member, who then repeats the process until all guests have finished. Use pirate floats, kickboards or swim rings for your games. 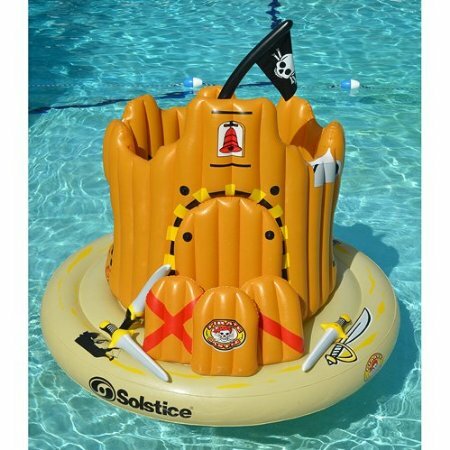 This pirate ship pool float will make a big impact when the "mates" see it floating in the pool. There are lots of ways to use the ship for relay games or races. Place "treasures" in the boat like plastic necklaces, bracelets and rings. Divide the guests into two teams. Two at a time, one from each team races out to the pirate ship to get a treasure to bring back. Then the next team member swims to the boat. If anyone tips the ship that team loses. 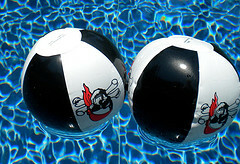 Have two pirate beach balls balls - one for each team. Divide your little pirates into two teams. Half the team is on the shallow end and the other half at the deep end. One swimmer from each team needs to get his beach ball to the deep end to be given to the next team player. The ball needs to stay in the water - it can be pushed - but it can't be thrown. When the beach ball gets to the deep end the next team player pushes the ball and swims to the shallow end. The first team that finishes wins. We bought enough pirate beach balls for each guest. The kids loved playing with them and the plastic swords in the pool. Swim up through the center and slide down the moat slide for tons of pool fun. Three inflatable swords and shields come with it . Use them for race props. Each team gets one sword and one shield - they have to swim out to the island to get them and bring them back to the next team member. The next racer swims them out to the island and leaves them and then goes back to his team. Just let the kids make their own pirate fun jumping off the island, swimming under the opening or sliding down the slide. This one is made of really durable vinyl as it should be since it costs just over $100. Our swimming pool has a deep end with a diving board, so while the winning team members are rewarded with pirate prizes, the losing team members must each take their turn, and "walk the plank" holding onto their inflatable sword . For safety reasons, of course no blindfolds. Each person on the losing team (that is able to swim) simply must walk across the diving board and jump into the deep end.